Before we get to the meat of the post, let me get a couple things corrected. A) I guess that last package I posted was a Zippy Zapping, ZZ has hit me before, but man, I totally screwed up saving his address. I can't recall if I PWE'd him, but if I did the hell if it ever arrived. B) I did that 17 month long posting from Wes, and I forgot to mention that one of the boxes was stuffed with about 40 wax packs, which were a blast to rip. Thanks again, Wes. Ok - corrections made. Now let's make some connections, specifically with my local bud Nick from Dime Boxes. Nick has talked many times about the flea market he hits in Rosemont, and I have been trying to make it up there. Well, Sunday was the last weekend for 2014, and we couldn't have asked for a more beautiful day. So I took the hour ride north, paid my two bucks and started walking. Quick note: this thing is frigging huge. Far bigger than any I go to. Yeah, Kane County is probably close in size, but that is more of a craft fair than a flea market. Anyway, I have been Jonesing for some quality dime boxing, and sure enough, the boxes lived up to the hype. And I ran into Nick, so that made digging through the boxes even more enjoyable. All total, I picked up about 130 cards between two vendors. Nick did over 50 more - the man is a machine. But along with some cards for blogger's collections, I added some nice cards to my binders. 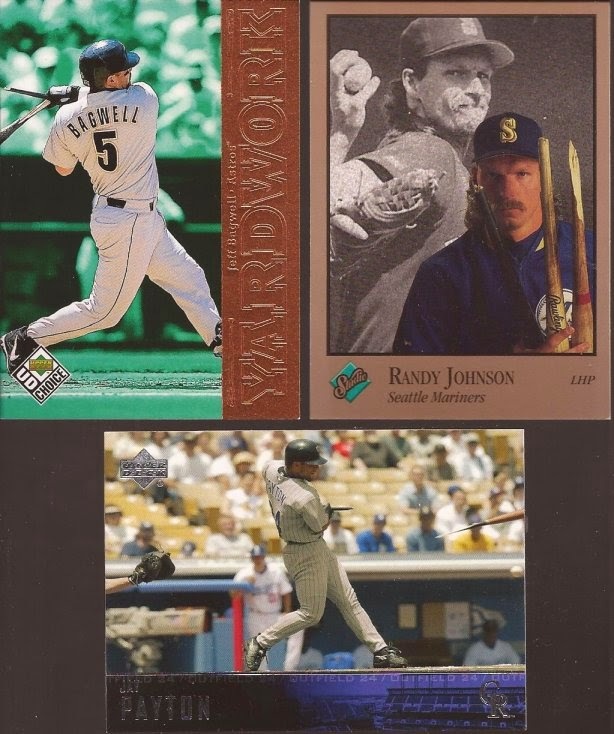 I think these are the highlights of the 14 throwback cards I found. It was the socks that made me stop, but I had to look closer to realize it didn't say Orioles on the chest. From the patch on the left sleeve, these are supposed to be throwbacks to late 30/early 40 St. Louis Browns uniforms. Problem? They aren't. There is a missing strip down the center of the uniform. But I give them credit for the effort. Some more great throwbacks. I recall that Bonds card on the left. I believe it is now in Arpsmith's collection, because I sent it there before I started a throwback binder. That's fine, cuz it's back, with the Kent Black Diamond partner. ...to bunting. Man, I love 2003 Donruss. I need a cheap box of that to rip. Underrated in my book. All total, I added 30 new turns at second to my collection, which totals 717 total DP cards. I also increased my bunting binder by 29 cards, including that amazing '78 SSPC at the bottom. Just three broken bats. I have been hunting that Johnson for over a year, so a dime is a great price. That Payton is making me rethink the 2004 UD design. I like it. 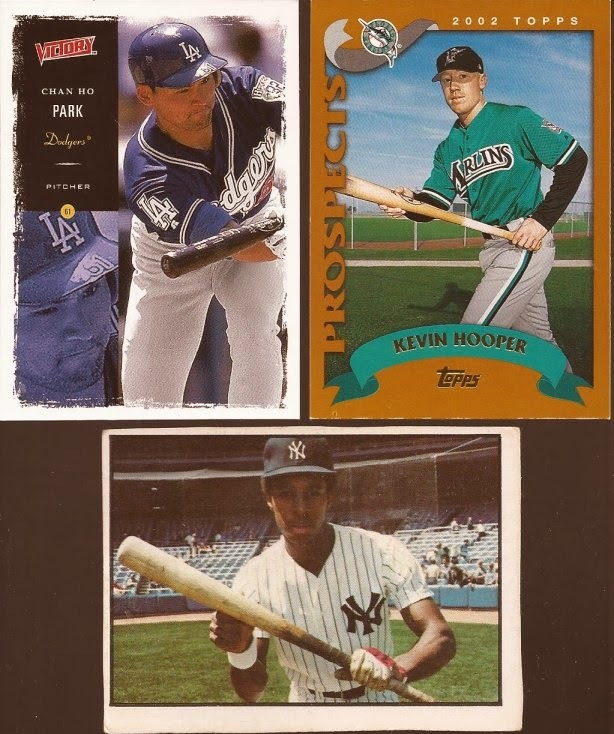 Lastly were these three gems for the player collections. A rare Reds Konerko card, along with a team set Konerko (I snagged the team set Beckham for my rainbow), and a Petrick I was needing. It was nice to shuffle through cards and chat up a collector next to me like Nick. His knowledge of cards surprises me. Some how he reminds me how dumb I can be in the hobby. It was a great time to dig through boxes, then stroll through and find some other cardboard. I am sure Nick will show off his pulls in time. Nick - see you in Orland in a couple months. Had an absolute blast digging through cards with you on Sunday, Jeff! Glad you could make it up to Rosemont. You certainly found some sweet pieces for your collections. Don't think you showed me that Kent throwback, what an awesome card! Those Yankee SSPCs were a treat as well. Should have my posts on my finds up tomorrow and Friday. Already looking forward to hitting Orland again soon! I remember opening a bunch of Fleer Authentix when it came out.